I'm thinking to know what is the usage of these parts of this circuit. It's the schematic of UT70C Digital multimeter. The way they are connected they'll act as a bipolar 8~9V "zener". They would be for over-voltage protection, is my guess. Edit: This is because of the reverse breakdown of the emitter-base junction, more at this Wiki reference (thanks to @Leo). The ~7V breakdown of the E-B junction is in series with the forward voltage of the other transistors E-B junction, adding up to around 8V, depending on the current. The transistors they are using are very inexpensive in China, and probably used elsewhere in their products, so they may be more attractive than conventional MELF zener diodes connected back-to-back. With limited components, how do I emulate a reverse-biased zener diode? What's the usage of this type of biasing? Two NPN Transistors in C-E to C-E Series? 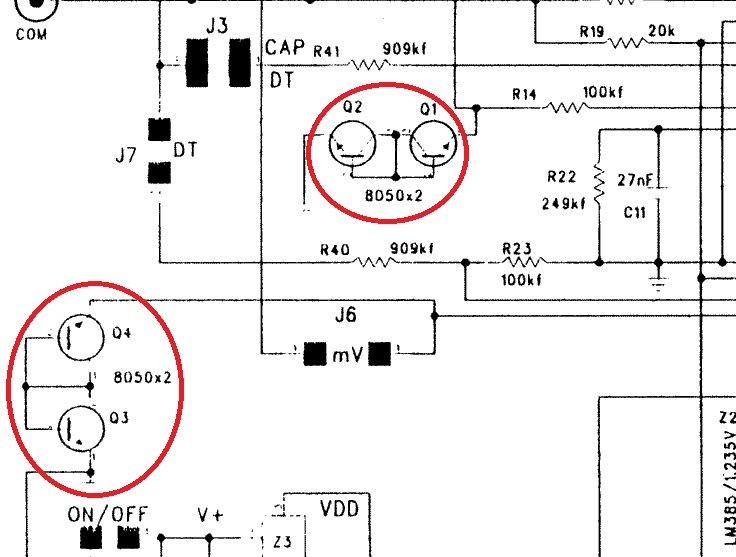 What does this part of a circuit with two NPN transistors do?